Gluten Free Granola: Copycat KIND Peanut Butter Whole Grain Clusters | Great gluten free recipes for every occasion. [pinit] I was just reading through the post about my first copycat recipe for KIND Granola (Maple Quinoa Clusters), and I laughed out loud. By myself. At what I said. I’m not sure what this says about me (don’t tell me/okay tell me/don’t tell me), but I pretty much don’t remember writing whatever I’ve written after I’ve written it. Even when I go back and edit it, it’s like someone else wrote it. Sometimes, someone who seems like a bit of a doofus wrote it. But sometimes, every once in a while, it’s like someone totally funny wrote it. Don’t tell me what that says about me (tell me). Anyway, I’m back with more copycat KIND gluten free granola and you know what? This variety (peanut butter whole grain clusters gluten free granola) is even better than the first. 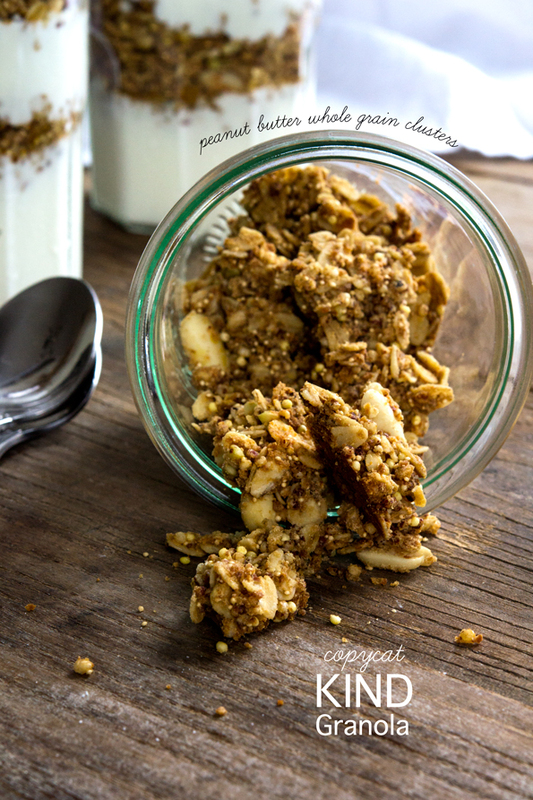 The mellow peanut butter flavor and the light sweetness in this granola is perfect with plain yogurt. Perfect! Now I KNOW you. I know you’re going to ask me if you can sub out the oats for something (nope), the peanuts for something (definitely), the peanut butter for something (another nut butter, perhaps) and on and on. Please remember that this is a copycat recipe. That means that I start with the ingredients the manufacturer used, and try to stick as closely as possible to them. So … KIND uses canola oil? So did I. Ditto whey powder. (Oh, and if you’re wondering that’s healthy chocolate syrup drizzled on top of that peanut butter goodness parfait above). They used soy crisps, and since I can’t really figure out precisely what those are (and didn’t necessarily think it was worth the while), I used crispy brown rice cereal. And I’m sure glad I did. Something else you could use? Puffed quinoa. Have you had that stuff? Oh heavens. So nice and crunchy! So healthy! 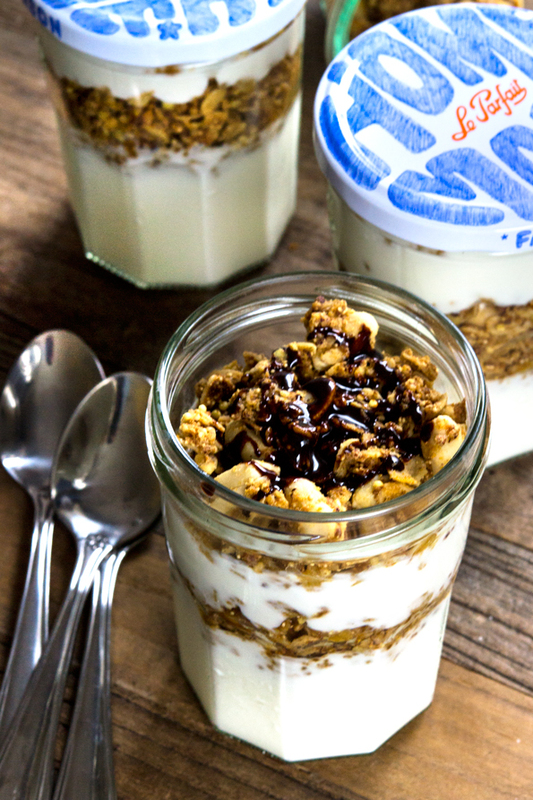 Layer this peanut butter granola with plain yogurt and let it sit in the refrigerator for a bit. Make it ahead, and take it for lunch. Or enjoy it for breakfast. The peanut butter starts to mingle with the tang of the plain yogurt, and the crunch softens a little but not too much. Oh it’s good. It’s just, well, worth it. And since I’d have to sell a kidney to buy KIND Granola on a regular basis, making it myself at home is much kinder and gentler. *Please be sure that every ingredient you are using is certified gluten-free, free from all potential sources of cross-contamination with gluten-containing grains. I purchased most of these grains online from nuts dot com. Preheat your oven to 275°F. Line a half-sheet (13-inches x 18-inches) rimmed baking sheet with unbleached parchment paper, and set it aside. In a small, heavy-bottom saucepan, place the peanut butter and oil and mix to combine. Place the pan over medium heat, stirring frequently, until the peanut butter is melted and the mixture is smooth. Set it aside to cool briefly. In a large bowl, place the brown rice flour, salt, and whey powder, and whisk to combine well. Add the coconut palm sugar, amaranth, millet, buckwheat, quinoa, brown rice cereal, rolled oats and peanuts, and mix to combine well (working out any lumps in the sugar). Add the oil and peanut butter, and mix to combine well. Make sure all of the grains are coated well with the peanut butter and oil. Scrape the mixture onto the prepared baking sheet, and spread into an even layer. Place in the center of the preheated oven and bake for 10 minutes. Remove the baking sheet from the oven, stir carefully to redistribute all of the ingredients and return to the oven. Bake for another 10 minutes. Again, remove the baking sheet from the oven, stir carefully to redistribute all of the ingredients and return to the oven. Bake for a final 10 minutes, or until the granola is lightly golden brown all over. 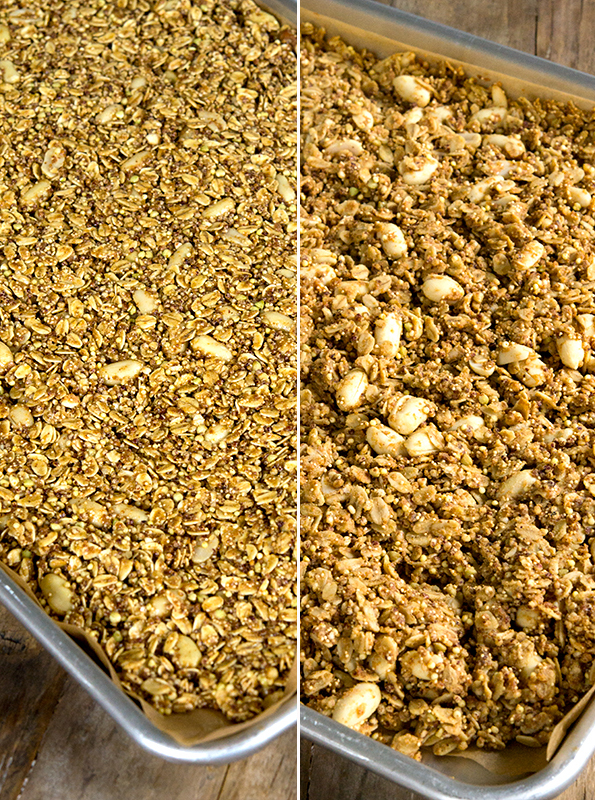 Remove the baking sheet from the oven and allow the granola to cool completely, undisturbed. 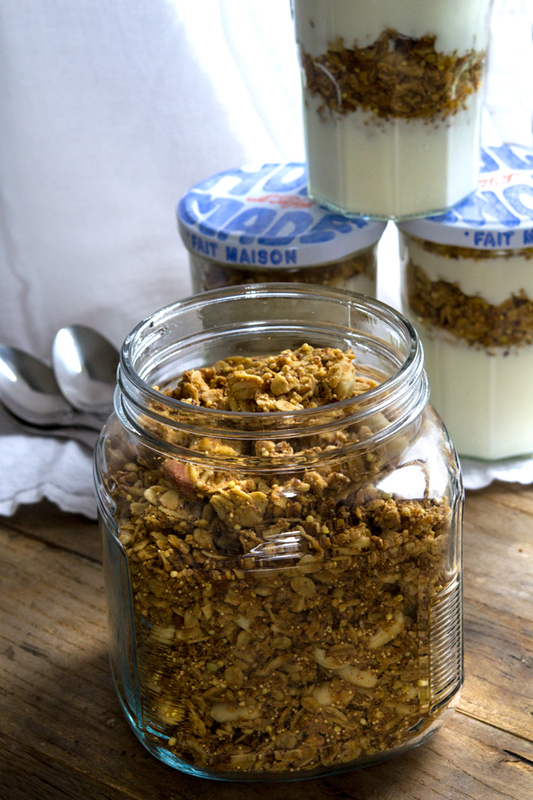 Transfer the granola to a lidded glass container, breaking up large chunks into smaller ones. Seal and store at room temperature. P.S. Don’t be fooled by the December 3 publication date of Gluten-Free on a Shoestring Bakes Bread. It will ship earlier than that from amazon (according to my publisher), so order today! My daughter has fructose malabsorption, so I converted this to work with her fructmal diet and it was wonderful. We subbed the coconut palm sugar with dextrose, equal amounts. We also used sliced almonds instead of peanuts because she doesn’t handle those well. We used just regular GF Rice Krispies and left out the buckwheat groats and quinoa since she doesn’t like them. We also used natural peanut butter (sugar free). Thanks so much for this recipe. We have to make so much from scratch because it all has fructose or fructans. Could I just omit the whey powder to make the recipe dairy free? Or should I substitute something else? Thank you so much for your speedy response! I want to also thank you for sharing all of your knowledge! I look forward to each post and laugh while reading it!! Have a great day, Nicole!!! I can’t wait for my book, either!!! Question……Nicole, where did you get those adorable jars you show in this picture??? You always have the cutest containers!! On a side note, I just got an email from Amazon saying that the book will be later than Dec 3. I hope it arrives sooner. I just can’t wait anymore!!!! This is like being a little kid again waiting for Christmas morning to arrive!! Looks so good-I love eating and enjoy sharing my own granola creations. I am certainly going to make this one. A question— the quinoa, do I cook first? As per pkg. instructions? Or does this just cook in the oven, from bag to baking pan? Am so making this for my trick -n-treaters! Hi, Cindy, nope. You don’t cook the quinoa. From bag to baking pan! Another awesomeness triumph!!!! I personally LOVE your writing. You write straight from the heart! Just pre-ordered your new book- I can’t wait to bake some bread…meanwhile I will try this granola looks delish! You never cease to amaze me, Ms. Nicole! Rock on! Yea – I don’t remember you being particularly wack-a-do in any recent post, so keep ’em coming girl! I love it when you do copy cats…. they rock! Recently, I found one sheet of a paper I had written in college. It was awful (though at the time, I’m sure I thought it was good) and I was embarrassed at my current self for having been such an idiot! I can only imagine that if I wrote something now and read it in 20 years, I would have the same reaction.